An exclusive gated resort, Beach Colony is located on 11 acres of fabulous beachfront. 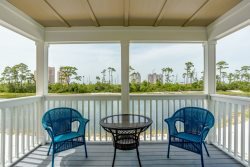 The residence is a Corner unit with breathtaking Gulf front views (South exposure) and East views of the pristine National Seashore. Wall-to-wall sliding doors and adjoining windows actually wrap around the living room, filling it with light, and revealing the panoramic beauty of the Gulf. The sweeping 300 SF terrace will be a favorite spot for quiet moments and lively gatherings alike. The uniquely situated Master Bath is a world unto itself. The extra deep soaking tub is surrounded by large, wrap-around windows to offer both a view and a feel of the hypnotic Gulf. For those who expect only the best, Beach Colony West Penthouse 1A is included in our collection of outstanding luxury vacation properties and is guaranteed to please the most discerning guest. This 16th floor Penthouse has 1928 SF with ceramic tile throughout Living, Dining, Kitchen and Bedrooms. The calming colors coupled with colorful coastal art make this vacation home one-of-a-kind. Electronics include 55 in Smart TV and Stereo in Living Room, 32 in Smart TV with built-in Roku in Master Bedroom, 40 in LCD TV, DVD in King Guest Bedroom and 32 in Smart TV with built-in Roku in second guest bedroom. Welcome to our beach house. We recently purchased and upgraded PH1A in February 2017 and completely redecorated the interior. Our unit is very spacious and will comfortably sleep 8 people without feeling crowded. Enjoy the fantastic views from all bedrooms, the living area and the balcony as you sit back, relax and take in the sounds of the Gulf. We hope you enjoy our beach paradise as much as we do. Please leave us a note and share your comments in our guest book. Friendly and helpful. We live in Europe...most everything was done via Internet. Very spacious, excellent views, very comfortable, well equipped kitchen & bathroom, fantastic balcony we went every day for walks on the beach, would have loved to stay longer...or come back again! We have been staying at this property for 4 years now. Its located in the area we like which is not in the middle of all the crowds and traffic but close enough to all the amenities you need while on vacation. Would highly recommend the property. Mrs. Cole was a doll! She was very welcoming and tried to accommodate our every need! This was our 3rd time renting through Perdido Realty and we will use them for our beach rental needs in the future. This was my second rental with Perdido Realty and The Beach Colony Resort. The team there is friendly and professional and we would recommend working with them again to anyone. Valerie is a rental expert and we loved talking to her when renting and about our new rental property that we close on in November. Beach Colony West has the best views as it is closest to the Gulf. It is also a great location with grocery store right over the bridge and close to lots of great restaurants. I would tell all of my friends to look into staying there in the future! The property was awesome! Just as described!